Another day, another confusing report about DeSean Jackson. Until something actually happens (like a trade or release), I’m not going to spend too much time discussing it. There’s just not much value in speculating when we’re clearly missing a lot of information. However, I have noticed something worrisome over the past week. Namely, people seem to be underrating DeSean Jackson. Make no mistake about it, DeSean Jackson is a great WR and he cannot be easily replaced. I find it remarkable that I feel compelled to write a whole post about this, but here we are. D-Jax entered the league in 2008. He’s played 6 mostly healthy season with the Eagles, with 87 games played. 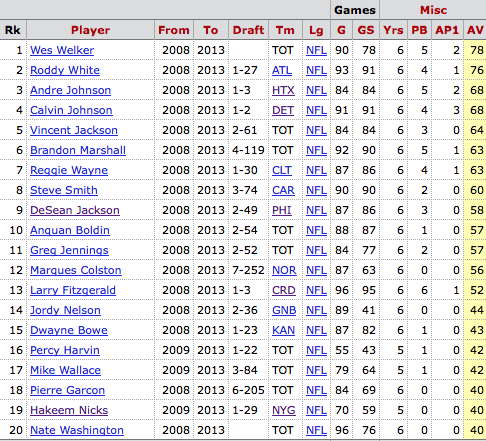 Take a moment and make a list of the 10 best WRs over the last 6 seasons. Seriously, jot it down. Is DeSean Jackson on there? Probably not, and I’m guessing many of you didn’t seriously consider putting him on there. Was that a mistake? Now go back to your list of the 10 best WRs. If you actually made it, I’m guessing there’s a LOT of overlap with the top ten WRs by AV. Of course, the point of this exercise is to highlight where DeSean Jackson is (and is not). By AV, he ranks 8th (tied), ahead of Larry Fitzgerald, Anquan Boldin, and Greg Jennings. He ranks just behind Steve Smith. The point is NOT that Jackson is a better WR than those players, that’s a different discussion. The point is that he has been among the best WRs in the game since entering the league. Note that Jackson gains AV points for his Return work as well, inflating his WR ranking. Of course, it doesn’t make much sense to hold that against him either. Spend a minute examining that list, and note that it underrates Michael Irvin by virtue of the 1990 cutoff date. Regardless, notice anything? Nearly half of them are sure-fire Hall of Famers. Most of the other half at least deserves consideration. Now you’re starting to see why I think giving Jackson up for little return is insane. In terms of pure production, DeSean Jackson is a GREAT receiver. Full stop. BTW, here’s the same filter, but sorting by Receiving Yards instead of AV. Again, we’re looking at the most Receiving Yards over the first 6 seasons of a player’s career, for all seasons since 1990. DeSean has more yards in his first 6 seasons than Roddy White, Isaac Bruce, and Antonio Freeman. Terrell Owens had just 53 more yards in his first 6 seasons, and actually averaged fewer yards per game. Like I said…GREAT, and apparently under-appreciated. Now let me attack the “replaceable” nonsense. There seems to be an argument out there that basically says: “This is an extremely strong draft for WRs, we can just draft his replacement then.” This is a fairly ridiculous argument. 1) Draft prospects are not guarantees! Remember the post I did on Hacking the Draft? Let’s take another look at the chart from that study. See the odds of landing a “starting” WR with a 1st round pick? Just 65%. It’s possible that this year’s draft has a higher probability of success. I’m willing to accept that assertion, but how much higher? Certainly, given what we KNOW about the draft, not all of the WRs drafted in the 1st round this year will pan out. Pulling from the studies I did on Skill vs. Luck in the draft, we ALSO know that there’s really no reason to believe the Eagles are more likely than any other team to be able to identify the WRs who WILL pan out. So if you were planning on replacing D-Jax via the draft, think again. It’s very possible, but it’s far from guaranteed, and we haven’t even accounted for the opportunity cost of a 1st round draft pick. Let’s say you DO “hit” on a WR if the first round. Surely then you’d have adequately replaced D-Jax, right? Not so fast. 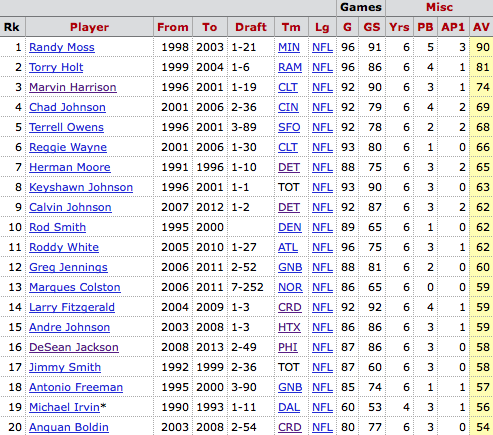 Here is a list of the best rookie WR seasons, by AV, since the 2005 season. Note that, last season, DeSean registered an AV of 11. 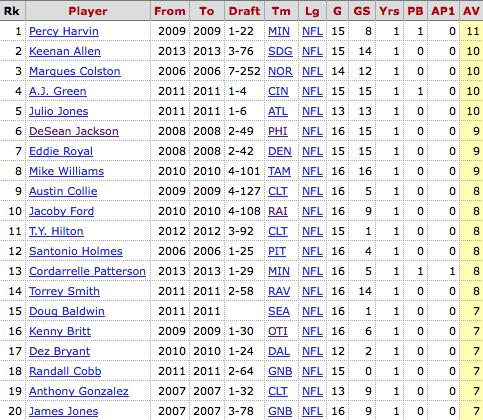 Since 2005, just ONE rookie WR (Harvin), has registered an AV as high as DeSean did last season. Moreover, look at the column labeled “Draft”. 12 of the top 20 seasons by rookie WRs were from players NOT drafted in the first round! Like I said, finding a great WR in the draft is NOT EASY, and certainly not just a matter of taking the best available guy in the first round. In fact, since 1990, just THREE rookie WRs have registered AV’s above 11. Randy Moss, Terry Glenn, Joey Galloway. That’s the list. 23 years, 3 players. Again, you’re probably not replacing DeSean’s production with a rookie from this year’s draft, at least not next season. For those of you who don’t trust AV, I’ve also looked at receiving yards. 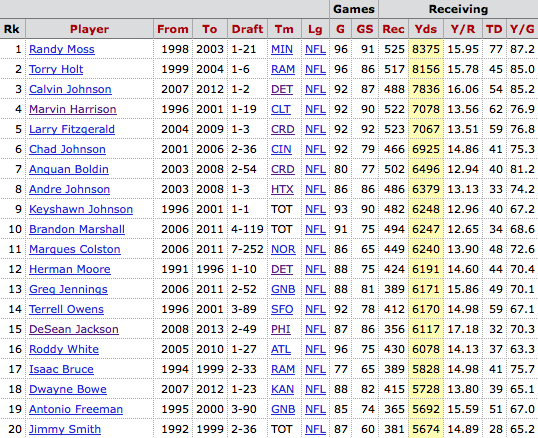 Here is the list of the best rookie WR seasons, since 1990, sorted by receiving yards. For reference, DeSean had 1332 receiving yards last year. This is going to be tough, but go ahead and count how many rookie WRs had more than 1332 receiving yards….finished yet? Thought so, counting to ONE doesn’t take that long. 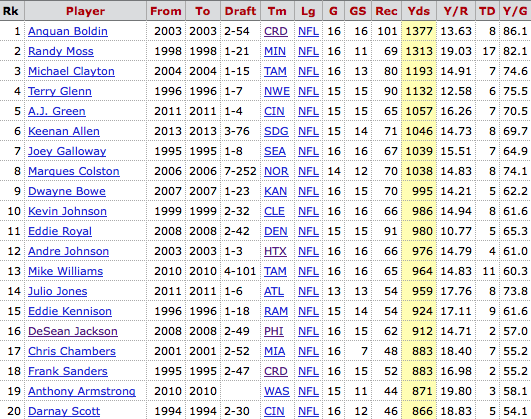 Note also that just 8 rookies have exceeded 1000 yards receiving. Remember, we’re looking at every WR in the league since 1990. That’s a long time. 1) DeSean Jackson is a GREAT player. 2) The Eagles will NOT be able to replace his production next season, even if they “hit” on a WR in the first round. One thing though: he’s completely useless in the red zone. Inside the 20 (maybe even 30) he seems to bee a non-factor. I love the player. But I think his overall stats skew what he has brought in terms of pure production in big games. So does that mean you replace him because he’s struggled in playoff games? Or do you upgrade the rest of the skill positions to either mitigate his struggles or free up more space for him to make plays? First of all, this analysis was terrific, and confirms what I’ve thought all along about Jackson. 1-34: This was his rookie year and first playoff game in Minnesota. Obviously he was a non-factor as a receiver, but he had a huge punt return into Minnesota territory that put the Eagles ahead early on…i.e. don’t discount his game-breaking special teams ability. 4-81: The upset win against New York. Pretty good numbers for a really windy afternoon. He had several first down catches, including a long, near-touchdown in the fourth quarter. 6-92-1: The NFC Championship game in Arizona. Matched up on DRC and had a 60-yard touchdown catch to put the Eagles ahead in the fourth quarter. If the defense holds on, that catch becomes one of the signature moments in franchise history. 3-14-1: A dismal performance by the whole team in Dallas. Had a red zone touchdown in garbage time. 2-47: The playoff loss at home to the eventual champion Packers. Pedestrian numbers, but if you recall, Jackson caught a pass over the middle in the fourth quarter and the defender made a shoestring tackle on him in space. If he shucks away, his speed gets him to the end zone and the Eagles win. 3-53: These numbers also look pedestrian; Keenan Lewis had done a good job on him through three quarters and the entire offense was sputtering. Once Lewis left with injury, Foles jump-started the offense through Jackson, who had several big catches, including a PI that covered 50 yards that doesn’t show up on the stat sheet. He also had a big second half punt return. The part where Randy Moss’s ridiculous rookie season wouldn’t replace DeSean’s yardage from last year is pretty mind-bending, especially since I believe Moss spent most of that season catching 65-yard bombs from Randall Cunningham in double coverage. That jumped out at me as well. My takeaway: it’s a different NFL now; plus I’m sure Chris Carter poached some of Randy’s potential production. Nonetheless, when I think of that rookie campaign, I invariably come back to the Thanksgiving game when Moss laid waste to the Dallas defense in front of a national audience. I agree with essentially everything you say. I don’t like the idea of losing Desean, and I think it is virtually impossible to replace his production with a rookie, particularly one drafted #22 overall at best. It also seems like creating a hole in the roster at WR before the draft goes against everything they are trying to do in free-agency; namely fill all holes to the point that you don’t NEED to draft any particular position and remain true to your BPA philosophy. The only things I would mention, however, are that: A) They would likely be expecting Maclin to replace most of his production (rather than the rookie WR), which may not be as unreasonable an assumption since his career numbers come close to Desean’s and would likely increase some in Chip’s system since everyone else’s did. And, B) Even if Desean stays, he may not, and probably won’t, match last year’s numbers with the presence of Maclin and Sproles and the 2nd year of Ertz. Nevertheless, the offense has to be more dynamic with him than without him. And with all of the other weapons plus a full offseason of preparation for Chip, the coaching staff, and Foles, this could be a truly special offense–why mess with that? I 100% agree that from a pure talent and production standpoint it makes no sense to dump Jackson, but remember Chris Carter been dumped by Buddy Ryan or us dumping TO? Both HOF candidates and we flat out cut em. The Steelers dumped Santonie Holmes for a 5th round because he was a headache for them despite him been a Super Bowl hero. Regarding replacing Jackson. A rookie WR would never do that, but Maclin, Sproles, Ertz and non AWOL Cooper can do that. c) league rule changes – in 1990, the rules were much more in favorable to defenses than they are now. A better metric than receiving yards would be % of the team’s total yards. This metric would indicate, over a 6 year period, how much of the offensive load the receiver carried and, thus, would passively factor in the opposing team game planning to take away the receiver’s production. Though Desean’s speed may be matched in the NFL by a mere few, his production needs to be filtered by a sharper lens in order to truly ascertain his value among his peers. You can replace yards. Atl had a 1000 yard reviever not named Julio or Roddy for example. What is hard to replace is TDs. Harry Douglas can’t replicate Julio/Roddy at producing TDs and that’s what matters most. It would have been more interesting if you did a section on TDs.